Minestrone soup is probably my favorite way to eat cooked, dried beans: hot, hearty, flavorful and nutritious. While it is usually made with red kidney beans, this Tuscan-inspired recipe uses white kidney beans (cannellini) and garbanzos (chick peas) for a change of pace. Because traditionally it is made using vegetables that need to be used up, it can be made with many different leafy greens; for this version, I like using spinach, chard, and/or kale. But feel free to use whatever you have on hand. This recipe is adapted from one on Mercola’s blog (1), originally from his book, Healthy Recipes for Your Nutritional Type (2). He doesn’t say how many servings his original recipe makes, but based on the 8 cups of broth needed, it serves 4 – 8. I have cut my adaptation in half, to serve 2 – 4. This is not a vegetarian recipe, but you can make it vegetarian by using a veggie broth such as my Potato Peel Broth, and not adding the optional chicken meat. The original recipe uses commercial chicken broth/stock, but you could use beef broth/stock if that is what you have on hand. I do, however, recommend making your own bone broths (chicken, beef, etc) as they will not contain questionable ingredients (like MSG or ‘yeast extract’) and preservatives. If you are vegetarian, I recommend Potato Peel Broth, as it provides important minerals; unfortunately, no vegetarian broth provides important gelatin that you get from bone broths. I make up a large batch of bone broth and freeze in pint and quart jars; if you have a pressure cooker, you could can the jars of broth. Or you could cook enough bone broth for this recipe, the day before you plan to serve the soup, then refrigerate overnight. I like to add a bit of diced chicken (in addition to the chicken broth), sautéing it with the onions. But I include it as an optional ingredient. You can use bone-in and cook in water to make part of the broth, or use boneless. 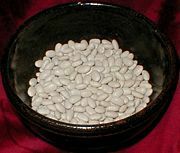 The original calls for 1 can each cannellini and garbanzos, but I prefer to start with dried beans, then soak overnight or sprout over 2 – 3 days, and cook them myself. I believe 15-oz cans are meant in the original, which each provide 3.5 half-cup servings, or 1 ¾ cups cooked beans per can. This amount of cooked beans requires 4 – 6 oz dried beans of each type. Thus my adaptation calls for 2 – 3 oz each of cannellini beans and garbanzos, for a half-recipe. Note that you could use red kidney beans, but the light-colored beans work better in a chicken broth base. See my Minestrone Soup for a recipe using red kidney beans and tomatoes. 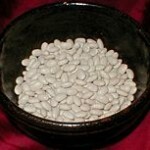 Prep beans, starting 1 – 3 days before you plan to serve the soup, presoak or sprout, then cook the beans and garbanzos (you can do them together); it takes much less time to cook them if they are sprouted. When tender, drain and set aside; refrigerate in a jar until ready to cook the soup. Prep chicken (if using): Brine pieces for 1 hour. Drain and pat dry. If using bone-in: If half-breast is large, cut it in half again, crosswise. Brown pieces lightly on all sides in lard or coconut oil, then add water to cover, bring to a boil over medium-high heat. Reduce to simmer and cook until done. Drain off liquid to use as part of the broth for the soup. Remove meat from bones and cut into small bite-size pieces. Sprinkle lightly with pepper; set aside in refrigerator until ready to use. If using bone-less: Remove meat from bones and cut into small bite-size pieces. Sprinkle lightly with pepper; set aside in refrigerator until ready to use. Day you plan to serve, prep veggies, herbs & cheese: Chop onion and celery, mince garlic, and dice the zucchini; set aside together. Wash and trim green beans, cutting them in 1″ lengths; set aside. If using kale, wash, trim and chop coarsely, and add to green beans. Wash and trim spinach or chard, and chop coarsely; set aside separately. Wash, trim and chop the basil (or other fresh herbs), and set aside. Bring water to a boil in small saucepan; add pieces of spaghetti and cook as directed on package. Drain and rinse well, and set aside. Soup: Heat a large pot over medium high heat. Warm the oil, then sauté prepped onion mix and bay leaf for 2 minutes. Season with salt and pepper to taste. If using chicken, add cut-up pieces to onions, and sauté 3 – 5 minutes until done, stirring frequently. Add cooked white beans, garbanzos, and broth/stock to the pot. Cover and bring to a boil. Add green beans, kale (if using), and cook for 8 minutes, (until veggies are just tender), adding prepped spaghetti to warm (if using) for last 2 minutes. Stir in lemon juice, then spinach (or chard) to wilt, and cook about 1 minute more. Stir in cheese if desired and serve in soup bowls, or reserve it to pass at the table. Top each serving with basil (or parsley). 5/13/15: made half recipe and added cut-up meat of 2 boneless chicken thighs, diced and sautéed with onion. Used homemade chicken stock, fresh green beans, spinach, zucchini, onion, garlic, and celery. Presoaked (overnight) a variety of white beans including cannellini, navy, and garbanzos; cooked, then refrigerated beans in a jar with just enough cooking liquid to cover until I made the soup the following day. Cut up Ezekiel spaghetti into 1″ lengths. Could not get fresh basil, so added some dried basil with the spinach, and thawed some frozen basil to garnish my bowl. It took less than 30 minutes to prep and cook the soup (after the beans were soaked and cooked). Result: Made enough for 2 – 3 servings. Very good soup, with a different, lighter flavor than traditional minestrone made with red kidney beans and tomatoes. This entry was posted in Fat or oil, Herbs, Leafy Veggie, Legumes, Onion family, Pasta, Poultry, Sauteed, Simmered, Soaked, Sprouted, Stock, broth and tagged basil, bay leaf, celery, chard, chick peas, chicken, chicken stock, garlic, green beans, kale, onion, parmesan cheese, parsley, pasta, romano cheese, spinach, white beans, zucchini. Bookmark the permalink.